Gather Financial Papers. Organize deeds, passports, insurance policies, estate documents, financial account statements, passwords, etc. in a fireproof box in a place where survivors can easily find it. Make a “Must Call” list. Compile a contacts information list that includes your attorney, accountant and any financial professionals who will need to be contacted when you’re gone. Passwords. Keep a master list of all user names and passwords. Pet Directives. Make plans for who will take care of your pets when you’re gone. Be sure the person(s) you have enlisted are on your “Must Call” list and that you have created detailed instructions for each pet’s specific care. Beneficiary Review. Make sure the beneficiary designations for your pension, 401(k), IRA, insurance policies and brokerage accounts still reflect your wishes. Check Credit Cards. In most states your spouse won’t be responsible for any debt on a card that is not in their name, but they also will not be able to use it and will have to reapply for credit in their own name. How Bills Are Paid. Keep a list of your accounts and how the bills are paid so your survivors don’t miss a payment or overdraw an account. Set Up Advance Medical Directives. You will need a health care power of attorney to designate the persons you want to make medical decisions for you in the case you are incapacitated. You will also need a living will to specify what measures you want the Dr to take to prolong (or not) your life. Designate a Money Person. You will also need a financial power of attorney so you can name a trusted person to make money decisions for you in case you are unable to do so. Household Furnishings Directives. Be sure to specify what belongings you have that you want to go to specific people or organizations. State if you desire the rest of your belongings be donated to a specific organization. Discuss Funeral Plans. This step will ease a substantial burden on your survivors if they know for certain whether you wish to be buried or cremated. Additionally, letting your survivors know it’s OK to not choose the most expensive funeral can alleviate anxiety related to these expenses. Review Wills and Trusts. Do this every few years or when there is a significant change in your life. If you do not have a will, get one! 2. Type your street address in the search box. 3. 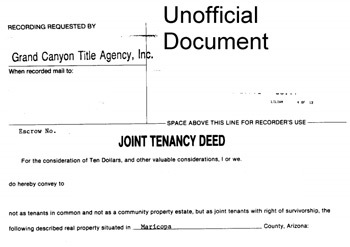 Click on Deed# under the Owner Information section. 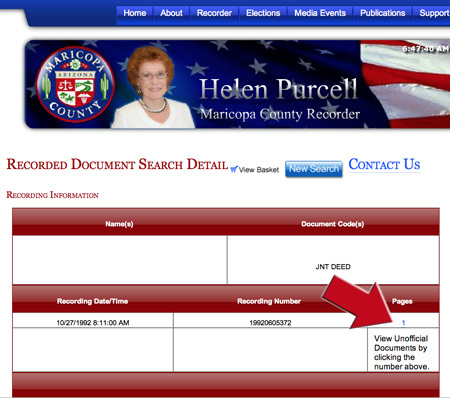 This will take you to the Maricopa County Recorder website. 4. 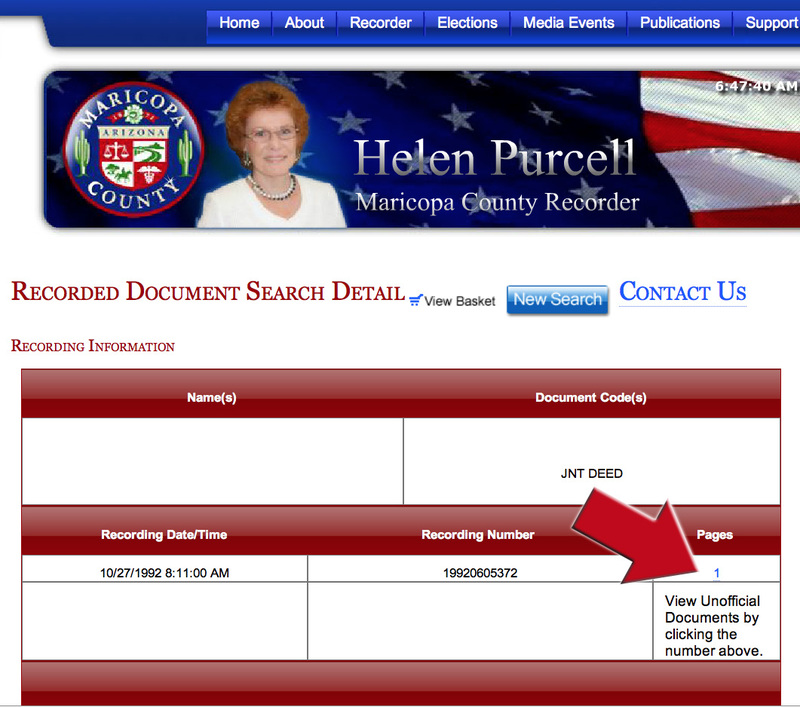 Click on Number under Pages to see a copy of your deed. If the title is not the way you want it, it is relatively easy to change. please call us at 602-952-0293.